Having a home with no windows would no doubt be a dreary experience. The benefit of allowing natural light into your home while getting a view to the outdoors is indispensable. However, the trade-off of having generously-sized windows is that this leaves significant portions of your walls without insulation. This results in quite a bit of heat escaping from your home during the cold winter months and excess heat entering your home during the summer, causing you to rely more and more on your internal heating and air conditioning to control the temperature in your home. Using these systems excessively can drive up your energy bills pretty quickly while also increasing your carbon footprint in the process. Luckily, Hunter Douglas offers great solutions for energy-efficient shades that can help you rely less on your heating and air conditioning to make your home comfortable. One of these great window treatments is the Duette® Honeycomb shades, a sleek and modern window shade that offers great energy saving benefits, easy privacy, and other advantages that will make any room more comfortable. The Duette® Honeycomb Cellular shades use a simple design to solve a number of problems. The design uses hexagonal “honeycomb” cells that easily stack when you raise your shades to open them while also expanding when you want to close your shades. This design results in a subtle textured appearance to your shades while the shape creates a sleek and modern appearance to your windows. These shades create their insulating effect by trapping air inside the cells, preventing heat from leaving your home when you want to keep it cozy during the winter and preventing heat from entering when you are trying to keep your home cool for the summer. The Duette® Honeycomb Cellular Shades are available with the Duette Architella® feature, which adds a second layer inside the cells for extra insulating properties. Keeping your home comfortable isn’t the only benefit of installing Duette® Honeycomb Cellular Shades into your home. These window shades can be greatly beneficial when installed in your bedroom, both for blocking light to help with sleep and by dampening sound for a peaceful effect all day long. The available LightLock™ feature is a brilliant innovation that offers true total darkness in your bedroom for a better night’s sleep. The design uses U-shaped side channels that overlap the back and front sides of the shades with micro-ridges designed to prevent any light from leaking through the shades. Installing Duette® Honeycomb Cellular Shades with LightLock™ could be your key to better sleep and more energy. Of course, you can customize your cellular shades to look just how you want them to on your windows. There are plenty of high-quality fabrics to choose from, along with various colors, textures, and opacities. 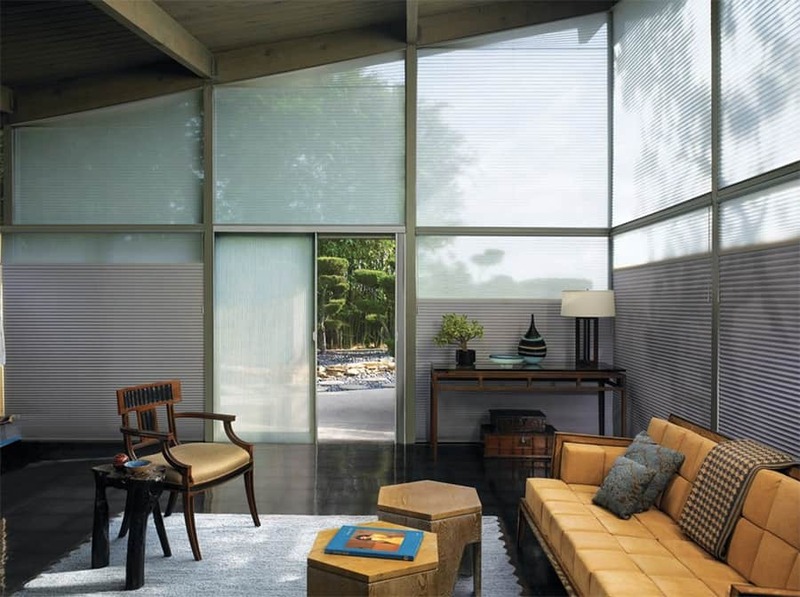 At Blind Builders, we want your windows to look beautiful while also helping you save money and have more peaceful sleep, which is why we offer Duette® Honeycomb Cellular Shades from Hunter Douglas. We are located in Feasterville, PA and serve Bucks County and Montgomery County, including Newtown, Yardley, Doylestown, and Warrington, PA. Come see us soon to find the right shades for your home.